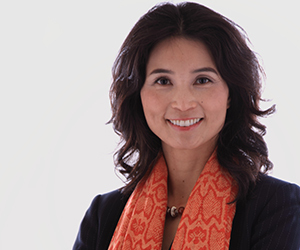 Though she’s no longer lugging books to class or spending countless hours in the library at the UC San Diego School of Global Policy and Strategy (GPS), Yiru Zhou ’93, is closer to her alma mater than ever. A member of the GPS’s International Advisory Board and co-chair of the advisory council for the School’s 21st Century China Program, Zhou, who is vice president of China operations for Qualcomm Technology Licensing, notes these commitments as a mere and natural progression of going from a student to an alumna of GPS. And for Zhou, her efforts to do just that haven’t gone unnoticed. She is GPS’s 2016 Outstanding Alumna. 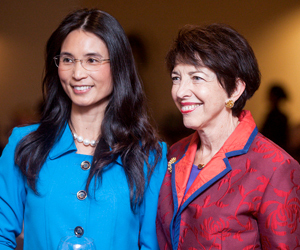 Zhou’s dedication to U.S.-China relations took professional shape immediately after graduating 23 years ago, when she joined Qualcomm Inc. in sales. It was a time when the wireless telecommunications industry was in the thick of change, transforming from analog to digital standards, Zhou recalls, noting she was recruited to Qualcomm’s code-division multiple access (CDMA) team to develop business and make CDMA one of the digital communications standards in China. After six years at Qualcomm, Zhou accepted a position at Ericsson, where she rose to oversee the company’s contract with China Mobile Ltd., which is among the largest telecommunications equipment accounts in the world. More than a decade later, she returned to Qualcomm and her San Diego roots. As vice president of China operations for Qualcomm Technology Licensing, she now is responsible for managing Qualcomm’s relationships with technology licensees in China, primarily original equipment manufacturers of smart phone devices. As part of her co-chairmanship of the advisory council for the 21st Century China Program, Zhou has been able to make new memories at the School. Foremost, she has been instrumental in gaining support for the program at Qualcomm, across San Diego and beyond. Zhou shared similar sentiments toward Shirk, recognizing her not only as a mentor but a role model. Register to attend GPS’s Salsa Saturday celebration on June 4, as part of UC San Diego’s Alumni Weekend, when Zhou will be recognized as GPS’s 2016 Outstanding Alumna. Duc Tran, BA/MIA ’12, Washington, D.C.